1. ADY-75 66 - 88 MHz. 5 MHz. 13 dBi. 2. ADY-150 134 - 174 MHz. 6 MHz. 15.5 dBi. 3. ADY-350 300 - 400 MHz. 12 MHz. 16 dBi. 4. ADY-850 700 - 990 MHz. 70 MHz. 16 dBi. 5. ADY-450 400 - 512 MHz. 15 MHz. 16 dBi. 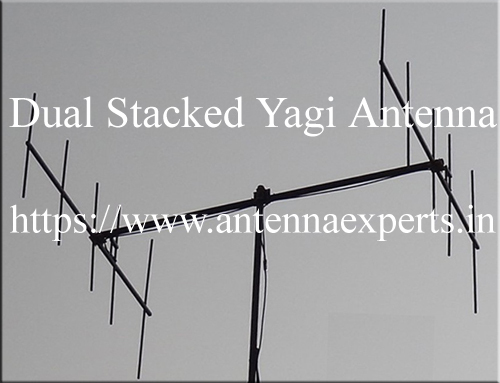 Antenna Experts manufacture dual stacked yagi for 75MHz, 150MHz, 350 MHz, 450MHz, 550MHz, 650MHz, 700MHz, 850MHz, 950MHz, GPS L1 band, GPS L2 band, 1450MHz, 1850MHz, 2100MHz and 2450MHz frequency bands. Our VHF Dual Stacked Yagi antenna, UHF Dual Stacked Yagi Antenna and Microwave Dual Stacked Yagi Antenna design reflects innovative modern antenna construction. The Dual Stacked Yagi antennas are designed for rear mounting and are supplied with stacking pipe. These Dual stacked antennas are designed to stacked and fed in phase with supplied matching phasing harness cable for increased gain to 3 dBi. The dual stacked yagi antenna can be stacked either in horizontally or in vertically to control the beam-width in desired plane. Radiating elements, supporting booms and adjoining metal castings of Dual Stacked Yagi antenna have been constructed in 6063T6 ultra corrosion resistant architectural anodized aluminium alloys to prevent corrosion. Our VHF UHF Dual Stacked Yagi antenna is supplied with powder coating finish to protect the dual yagi antenna further from severe environmental conditions. The VHF dual stacked yagi antennas when packed, comes with elements removed from the antenna boom for ease of packing and transportation where as the UHF Dual Stacked Yagi Antennas comes in pre-assembled design with permanently fixed elements in to the support boom. The mounting hardware of VHF UHF Dual Stacked Yagi antenna is made of type 316 marine grade stainless steel. Special mounting hardware permit to mount the vhf uhf yagi antenna either Horizontal or Vertical polarization. These Yagi Antenna are highly directional, comes factory tuned and does not require any field adjustment. The feed point radiator of yagi antenna is enclosed in a Nylon housing designed to protect against severe environmental conditions and minimize pattern distortion. Antenna Experts Dual Stacked Yagi antenna design reflects innovative modern antenna construction. The unique design of the dual yagi antenna feed which works as matching device to keep the VSWR low resulting in increased efficiency of the yagi antenna.